Jenny Harvey remembers some first aid training from not so long ago that stressed never use a tourniquet. Yet here she was, learning how to properly place a tourniquet on a mannequin with a bad leg wound. 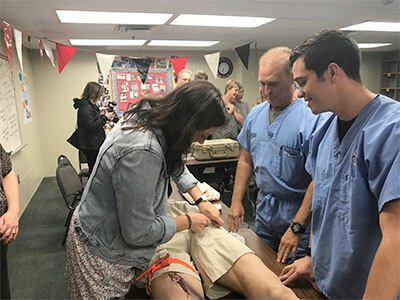 Members of the trauma service at the University of Alabama at Birmingham were teaching bleeding control techniques to teachers like Harvey at Homewood High School, as part of the national Stop the Bleed campaign. Homewood High teachers practice bleeding control techniques under the watchful eye of the UAB trauma service.“We used to be told that tourniquets were dangerous,” Harvey said. That thinking has changed in the past few years. Military battlefield medicine and, more poignantly, mass shooting events in America have resulted in tourniquets’ returning to favor in cases of severe bleeding, especially in the absence of quick professional medical response. The Stop the Bleed campaign, organized by the American College of Surgeons and Hartford Consensus, points out that victims can quickly die from uncontrolled bleeding, as soon as five or 10 minutes after injury. The campaign aims to provide the general public with the knowledge and tools to respond quickly in the event of an emergency, even before trained professionals can arrive. Stop the Bleed is modeled after the very successful efforts to place AEDs — automated external defibrillators — in public places. Homewood High School was the launching site for UAB’s public efforts. The Division of Acute Care Surgery trained about 100 teachers, and provided enough tourniquet kits for every classroom. Teachers in groups of 10-15 underwent the one-hour training. Members of the UAB trauma team taught bleeding-control techniques, including the use of tourniquets, and gave the teachers hands-on practice on realistic mannequins. The tourniquet kits consist of a web and Velcro tourniquet with a windlass for tightening, along with gauze to pack a wound, gloves and basic instructions on bleeding control. The kits cost about $60. Kerby says he has trauma surgeons, nurses and emergency medical technicians ready to provide training; but he is missing one thing: more kits. Kerby says his team is also teaching proper bleeding control to first responders from area police and fire departments. He hopes to offer the training to additional schools or businesses as kits become available.